Abner, the commander of Saul’s army, was still very loyal to Saul and set Saul’s son, Ish-bosheth, over Israel. They decided to have a showdown to see who would be the king over all of Israel. If you read 2 Sam 2:12-32 it feels much the same as the earlier Israelite battle against the Philistines involving Goliath. They chose 12 men from each side to fight each other, but they all end up killing each other, so they end up having a war on a much larger scale – the men of Abner/Ish-bosheth against the men of Joab/David (which most scholars believe last about 2 years). And let’s just say that Abner’s men got a pretty bad whooping. It’s so sad though because these men were brothers fighting brothers! Israelite against Israelite. A small civil war. Even though David was king, he still had to fight for it. There was a long war. But what is repeated over and over is that David never had the bloodguilt of any person on his hands, but that his men fought for him! During this time, David apparently collected more wives and also started building his legacy. Abigail gave him a son named, Chileab. Or if you’re reading 1 Chron 3:1, his name is Daniel. The name Chileab meant “like his father.” Did she ever wonder if her son would be the one who would reign after David? Did she speak those truths about God over her son just like she spoke truth over David all those years ago? Did she hope that he would be a man after God’s own heart, just like his father, David? The wife count is now at 7. How many wives is too many? According to the Talmud, the limitation of wives was 18. But um, I think 2 is one too many! The gathering of wives for kings in ancient times was like the gathering of power. The power of the wives was in the giving of sons. We certainly learned this in the study of the Wives of the Patriarchs. Sons ensured the continuation of the kingdom. But truly, you only needed one son to ensure the reign. Adding to that number would just result in favoritism, jealousy, sibling rivalry, and the lust for the power. How did Abigail feel about all the extra wives? We’ve talked about how the culture back then is so vastly different from our own, so it is difficult for us to know how she would have felt. My son looks more like David. My son is strong like David. Well, my son can play the harp like David. Who cares? My son is more kingly than all your sons! I’d like to think that Abigail was above all of this, because she’s just so loveable! But did her heart ache for more affection from the king? And more importantly did she hope that it would be her son that would be crowned king, even though he was 2nd born? Many scholars believe this was a political move on David’s part to ensure his right to the throne. (Berlin, David’s Wives; Kessler, Sexuality and Polititcs; Levenson, The Political Import of David’s Marriages; White, Michal the Misinterpreted) Still others believed this was to gain the favor of the Saulide party (Brueggeman, p. 226). Regardless of this, Michal’s second husband appears to have loved her very much, but she is taken from him. How is that heart looking now? The darkness begins to filter into that once very red, very much in love, heart. Abner keeps his promise to persuade Israel to follow David by reminding them that God had promised David that it would be by David’s hand that he would save the people from the Philistines and all their enemies. (v. 18) His bold move to appeal to God’s will proved he wasn’t appointed as a diplomat and commander for nothing! Unfortunately for Abner, he dies at the hand of Joab, the commander of David’s army because he suspected foul play. And David is faultless. Then Ish-bosheth is murdered by two Israelite men from Saul’s own tribe. (2 Sam 4:5-8) Again, David is faultless. Just to clarify, the text emphasizes David’s pure rise to the throne by emphasizing that he never murdered anyone to gain the power of the throne. You might say that he trusted that God would make a name for him and that God would build him a house, establishing him a kingdom. David takes the throne, a blameless man, just as Abigail predicted. And she stands next to him, Abigail the Wise. Behind every great man is a great woman! It makes me wonder what the relationship between the two of them was like. She came to him, deferring as a servant, but did she find her place of honor as a wife? Did she, like the woman of virtue, continue to speak truth to him, being wise and discerning, doing good to him all the days of her life? Surely she was a priceless gem, one who continued to seek for his good. She was devoted to her King and her husband, the king. Her heart was one full of honor and was truly a heart of gold. This king David brings a fresh hope to the people of Israel. The time of darkness when the judges ruled is now ancient history. With great anticipation the people watched as God’s kingdom was realized in the man, David. If we had red flags in our Bibles, I’m certain there would be one at the tail end of this verse. He keeps taking wives and now concubines. David had success after success against the Philistines, and he and all of Israel came celebrating before the Lord, with the ark of the covenant. The ark had been captured during Eli’s time by the Philistines, and when they returned it, the ark ended up at Kiriath-jearim (a small town at the northern-most tip of Judah) where it sat for 20 years, seemingly forgotten. “The ark embodies what is unifying among the tribes and clans of Israel. The ark articulates and embodies for old Israel the holy rule of Yahweh. 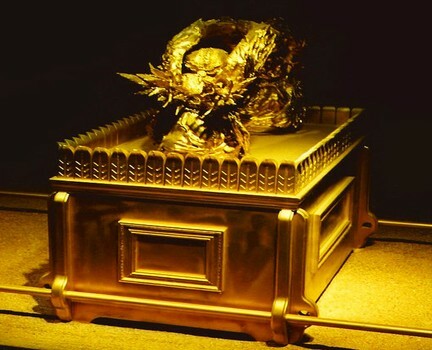 They [had] forgotten the significance of the ark, which referred to the raw presence of Yahweh, the power of Yahweh, and the covenantal implications of Yahweh’s sovereignty.” (Brueggeman p. 248). “The coming of the ark signified two things for the king. 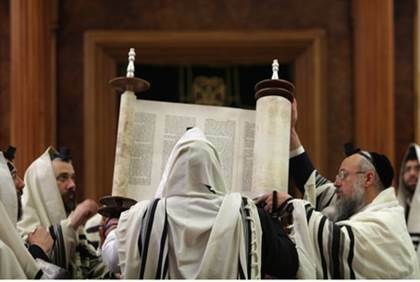 Looking back, it meant a reengagement with the taproot of Israel’s religious vitality. 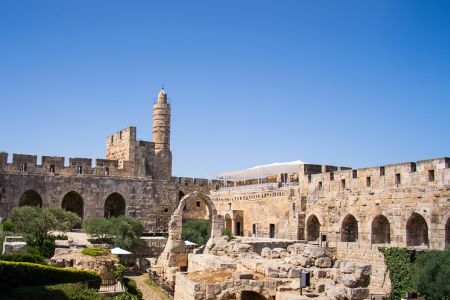 David here gets back in touch with the most elemental dimensions of Israel’s traditional faith; it is no wonder that the movement of the ark evoked such a stupendous celebration. Looking forward, it brought David royal legitimacy.” (Brueggeman, 249). It meant that God approved of David’s reign as king, that it was God’s will. This word “dancing” is not used anywhere else in Scripture but seems to describe a whirling dance. I think we can assume he was expressing his joy! It is the same thing David used two of the times he inquired of God. It was the ephod with the Urim and Thummim that one of the priests had brought to David way back when Saul was still chasing him and which he used to seek God’s direction. Here though, David, the king, not a priest, wears the ephod. Maybe the question is why was David wearing a priestly garment? It is a picture of a truly godly man, one whose desire was to lead the people to worship their God, just as the priests were supposed to do. He doesn’t simply tell them what they ought to do, he shows them what to do – worshipping the Lord with all his might! In addition, he appears to be in the role of a priest as they are bringing the ark of God to the “city of David” (v. 16). It shows him offering sacrifices to God as they carried the ark along so that God’s anger would not burn against them again after what happened earlier. Then in v. 17 after they arrive, he offered burnt and peace offerings to God. David leads the people in gratefulness to their God who has very visibly (in the ark of God) taken up residence in the “city of David” to be among His people once again. However Miss Michal was none too keen to observe her husband. This is the tower at the palace in Jerusalem. You can see how she could have easily watched him from any one of these windows! As we try to understand her response to David, I want you to notice how she is identified in v. 16 – as the daughter of Saul not the wife of David. Sometimes a description like this speaks volumes. Her loyalty was with her father after those long years spent away from David. The text is silent about her psychological condition – whether or not she felt slighted or abandoned by her husband after all those years. What is most likely is that the writer, identifying her as Saul’s daughter, wanted to show the disdain of the old house of Saul in the midst of the celebration. (Brueggeman, 251). Interestingly, Michal is only referred to as David’s wife 3 times – in 1 Sam 19:11 when she is saving him from her father, in 25:44 when Saul gives her to another man, and in 2 Sam 3:14 when David requests for “his wife” (but after he’s already referred to her as “Saul’s daughter”). The word despise in the Hebrew is the word “bazah” (baw-zaw) and it meant to despise, hold in contempt, disdain. Is she simply irritated that he doesn’t appear to be acting in the way a king should act – regal? Dignified? Honorable? The text already told us he was wearing a linen ephod, so why is she accusing him of uncovering himself? When you look up the use of this word “uncover” it has at least 20 different meanings – some of which include being banished, betrayed, carried away into captivity, exiled, to be deported, laid bare, opened, removed, revealed, stripped, uncovered. The connotation seems to be in relation to exile, captivity, humiliation. Why does Michal believe he acted shamefully? No one else seemed bothered by these events or by his behavior. None of the other wives take issue with his actions. “David refutes her judgment by saying he may be contemptible in her eyes, but in the eyes of the maidens (and therefore of political opinion) he is more honored.” (Brueggeman, 252). So the central feature is that God has chosen David “above and above” to be prince “over and over” Israel. This claim dismisses Michal and the entire Saulide claim to the throne. It is God who legitimizes David’s claim to the throne, not Michal or Saul. David’s wives likely grew up learning about the covenant God had made with Abraham, Isaac, Jacob, and Moses. They would have known that God had set the nation of Israel apart. They would have learned about the dark times of the Judges and how the people did evil in the sight of God. There would have been an anticipation among them of hope for a godly king who would lead the people to serve God wholeheartedly. What must it have been like for them to know that it was their David whom God had chosen as the godly king with whom He would establish His covenant forever? Michal’s heart revealed that she despised him. But Abigail? Was she as delighted in God’s chosen man as God was? Did she dance with the people at the entrance of the ark of God? The presence of God visible for all to see and know? As for David, he would know that God had chosen him, not because he was an amazing person but simply because God wanted to express His love to him. David wanted to make a house (temple) for God but God said he would make a house (dynasty) for David. God would make David’s name great. God would establish David’s kingdom. God. God. God. David didn’t need to do anything to make a name for himself. David didn’t need to do anything to make himself a house. He didn’t need to establish his own kingdom. It would be by God’s hand that these things would take place. And interestingly God tells David that He would also establish the throne of David’s son (yet to be named). God tells David that He would correct David’s son when he sinned but that His love and presence would never depart from David’s sons as He had done with Saul. God knew that David’s son would commit sins and yet He still promised to correct him and to love him. This is an oracle of unconditional promise, unlike the conditional character of the Mosaic law. (Brueggeman, 259) Even those “sons” who came after him would be loved unconditionally. What is more, God tells David his kingdom would be forever. He would not take away the kingdom from his house, even if those who came after stopped following God’s ways. God ensured that He would continue His covenant even if His chosen servants were unfaithful to Him. He promised. And God does not lie. God does not forsake His promises. God knew exactly what He was getting Himself into. He knew even before He made Adam and Eve. He knew that just like Abraham and just like Moses, David and his sons after him would not be able to keep the covenant. They would fail. But God would remain faithful to His promise. How could God possibly make this happen? How could sinful men ever hope to be a part of His plan? We read about king after king, who, no matter how godly they were, would not measure up to God’s standard. Even if God managed to keep a Davidic descendant on the throne, the people would continue to sin, fall away, cry out, repent, return, then continue in this cycle of sin. How could their hope ever be in the race of men? Even as Israel would fall away after having evil king after evil king, still God would place a Davidic descendant on the throne in Judah. But God had a BIGGER plan. When God made the covenant with Abraham in the days of old, He promised that even if Abraham broke the covenant, He would ensure Abraham’s side of the deal. He would take it upon Himself to hold up the covenant for both He AND Abraham. Well God knew that none of us could keep the covenant. Not David, not Solomon, not any king of Judah, not anyone. He would send His Son, a descendant of David, who could hold up the covenant for both God AND for man. Jesus, the exact representation of God, came in the form of man, so that He fulfilled the requirements for both God AND man. Our hope is in this God-man! How could God promise David a never-ending kingdom? By sending His Son, the eternal God! We had no hope of ever overcoming the cycle of sin so Jesus became the ultimate sacrifice once and for all that was able to cancel the power and cycle of sin and death. Jesus OVERCAME. He is worthy! And He became sin who knew no sin so that we might become the righteousness of God in Christ! This is His reckless, relentless love. 2 Sam 8:14 tells us that “the Lord gave victory to David wherever he went.” He had success on the battlefields and was a king who administered justice and equity to all his people (v. 15). This chapter and the next 2 chapters serve as a summary of David’s reign, so you can assume that many years pass between these chapters and the sin with Bathsheba. We read of how great David was all those years, and then we get to chapter 11 and would rather just close our Bibles and go on our merry way, leaving our view of godly David still intact. Everyone is aware of the scandal in the palace. It is all too familiar that I fear we have forgotten to read this narrative with eyes to see the woman at the bath and the man on the roof. Bathsheba was referred to as “the daughter of Eliam, the wife of Uriah the Hittite” (2 Sam 11:3). Her name meant “daughter of an oath.” Both Eliam and Uriah were two of David’s “mighty men” (listed in 2 Sam 23:34, 39). She was someone’s daughter, someone’s wife. And David most certainly would have recognized the men to whom she belonged! Many scholars believe she was also the granddaughter of Ahithophel, who is said to be the father of Eliam. Ahithophel ends up becoming one of David’s counselors who later betrays him when David’s son, Absalom, tries to overthrow him as king (2 Sam 15-17 and 1 Chron. 27:33). The text does not tell us whether or not her bathing was right or wrong. It also doesn’t tell us whether or not David walking around on his roof was right or wrong. 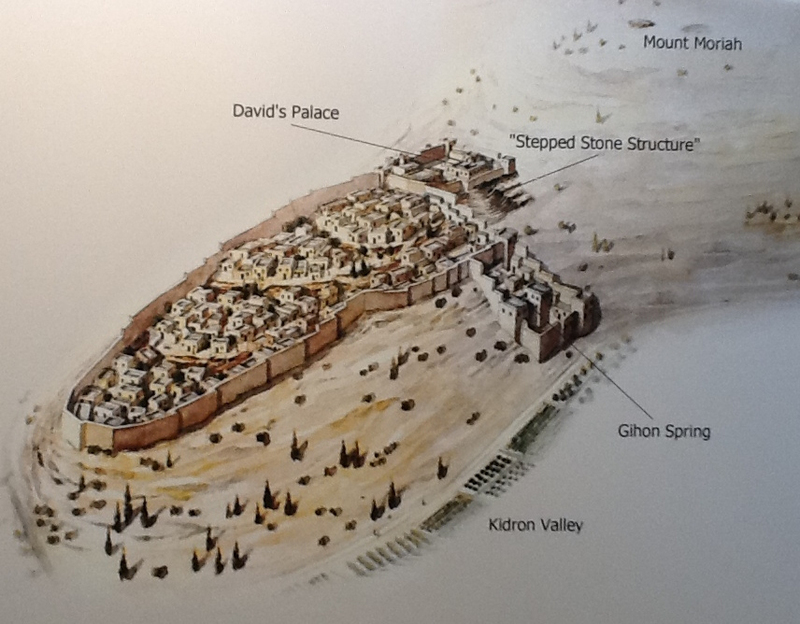 Here is a picture showing the city of Jerusalem and where David’s palace would have been. During Solomon’s reign the Temple would have taken up the entire top portion of the city (shown in this picture as land). The main message is that David saw and then he took. He did what was right in his own eyes rather than averting his eyes. He took what was not his rather than being content with what was his. I mean, how many wives did David have at this point??! He had the 7 wives, then in 2 Sam 5, he added more wives and also concubines. I’m pretty sure he didn’t need to take any other women for his own pleasure. Kings are “takers”, and David, who had started out as one who received from God’s hands, has now become a king like the kings of other nations – a taker. He had previously had everything gladly given to him by Yahweh and his followers, but here, we see his decline as he takes what was not his. This is rather uncomfortable to talk about because it shows a side of David that we’d rather not believe of him. This is the part where we find the skeletons in David’s closet! The man after God’s own heart stumbled greatly in this one moment. Unfortunately we can only guess what Bathsheba was thinking when one of David’s messengers called for her to come to the palace. Imagine the scene from Bathsheba’s perspective. Who is at my door? Is Uriah home from battle already? The king? He sends for me? What exactly does he want? Why are you taking me to David? King David, may you live forever, blessed be your kingdom. Did I just hear right? David wants to do what with me? How can I say no to the king? What am I to do? I’m a married woman! Uriah and my father are his loyal servants. This will not look good if word gets out. What will people think of me? I cannot believe I’m pregnant! How am I going to tell Uriah? I can’t possibly tell him. What will he think of me? Of the king? I have to tell David. He’ll know what to do. It’s utterly despicable. Then David definitely “takes care” of the problem. Only now, Bathsheba is pregnant but with no husband. She’d be viewed by all as the city whore. How could she be pregnant if her husband died in battle? She couldn’t tell anyone whose child it was. They wouldn’t believe her! David put her in the worst possible position. She had nowhere to go. She should be put to death according to the law. In fact she might as well have had a big SCARLET LETTER A written on her heart. Have you ever been marked like Bathsheba? Have you felt like your heart had a big scarlet letter A written over it? David, thinking he had covered his tracks, sends for Bathsheba to be his wife after the period of her mourning was over for her dead husband. Though David had taken her as his wife, she’s still referred to as Uriah’s wife until v. 24. Though it does not excuse his sin, he does not leave Bathsheba to die an adulterer’s death. God does not give either David or Bathsheba the punishment they deserve. He shows them mercy and sends Nathan to David with the message from God. “10 Now therefore the sword shall never depart from your house, because you have despised me and have taken the wife of Uriah the Hittite to be your wife.’ 11 Thus says the Lord, ‘Behold, I will raise up evil against you out of your own house. And I will take your wives before your eyes and give them to your neighbor, and he shall lie with your wives in the sight of this sun. 12 For you did it secretly, but I will do this thing before all Israel and before the sun. The fulfillment of this seems immediate because of how the text is laid out in our bibles, but it’s very possible that much time passed in between the statement and the actual fulfillment. In response to this egregious sin, Absalom, the son of David’s wife Maacah, kills Amnon to avenge his sister (2 Sam 13). Then Absalom tried to overthrow David, and thus David had to fight against Absalom and his forces to defend his kingdom (2 Sam 15-19). Joab later killed Absalom (2 Sam 19). Adonijah, (Adonai – jah) the son of David’s wife, Haggith, tried to establish himself as king in David’s place, and Solomon eventually had him executed (1 Kings 1 and 2). Here is where Bathsheba is called David’s wife – after the death of this first child, conceived in sin. Perhaps we can assume God also wipes her heart clean. He put away the Big Scarlet Letter A. She had a heart restored to honor. Please note that a long time has elapsed before Solomon is anointed as king. So far, David’s firstborn and third born sons are dead, thus leaving room for Abigail’s son, Chileab/Daniel, to take the throne. The text is silent, however, about any attempts on his part or Abigail’s part to secure the throne. He either didn’t try to do this or another theory suggests he is no longer alive. That leaves the fourth born, Adonijah (pronounced Adonai-jah)! However, we already learned that Adonijah, the son of David’s wife, Haggith, tried to take over the throne as well. He is David’s 4th son, born to him at Hebron. He would have been one of the “older” sons based on this information. Bathsheba’s 4 sons and the other 9 sons born at Jerusalem will be classified as “younger” sons. The text does not specify how old he was when he began to reign nor how old he was when he died. Based on other events, scholars surmise he was between 12-25 years of age. At the sound of the celebration, Adonijah and his cohorts are terrified. Adonijah tries to beg for mercy by taking hold of the horns on the altar. But he is still not an honorable man and later goes to Bathsheba to request to have David’s nurse as his wife in 1 Kings 2. Because this was seen as an attempt to take the throne from Solomon, Solomon sends Benaiah to execute his brother, Adonijah (v. 22-25). God often chooses people who are the most unlikely candidates for the position. God chose Solomon to reign in his father’s place, but Solomon was one of the youngest sons born to David. He ousted his older brother Adonijah. God chooses the foolish things in the world to shame the wise. He chose the son of Bathsheba, the woman taken by adultery, as the heir of the Messianic kingdom. He chose Isaac over Ishmael, He chose Jacob over Esau. God chose Joseph and gave him 2 portions for his two sons, Manasseh and Ephraim. He chose the unlikely Hebrew, Moses, to be his champion. He chose Rahab, the pagan prostitute, to be included in His people. He chose Deborah, a woman, to be a judge. He chose Samson to stir up trouble with the enemies of God. And He chose David, the youngest in his family to succeed the king He had already rejected. Some finals thoughts about Bathsheba – she was a woman whose HONOR is restored. She becomes the queen mother. She had a royal, purple heart. I kept trying to find a common thread for these women, and that thread was David! There’s also a thread of Honor that runs throughout the narratives in the lives of these women. What I did see was how Michal had a heart devoted to David until life happened and she allowed a bitter root to creep in to her heart. She lacked a heart devoted to God. Michal speaks to me to guard my heart and be on the lookout for areas of hurt that could give the enemy an opportunity to strike. She was Michal: A Heart that Lost Honor. For Abigail I saw a woman with a humble strength who knew and spoke truth about God, and though she had plenty of opportunities for bitterness or hate, she chose to trust her God. Her heart was first devoted to God, the King of Heaven. Abigail teaches me to trust my God and speak the truth. She urges me to be brave and wise in how I encounter relationships. She challenges me to be humble and to be a servant. She was Abigail: A Heart Full of Honor. And Bathsheba is a tough mixture because of the scandal in the palace. But I saw a woman who was loved by the king, and whose child was loved by God. She was given a place of honor not only by her husband and her son, but by God, who places her in the lineage of the Messiah. Bathsheba whispers to me that God is the God who forgives. She encourages me to seek God in the most difficult of circumstances and to know that HE is the one who restores me to places of honor. She was Bathsheba: A Heart Whose Honor is Restored. More importantly I saw how desperately we need God. That sin cycle would never end. 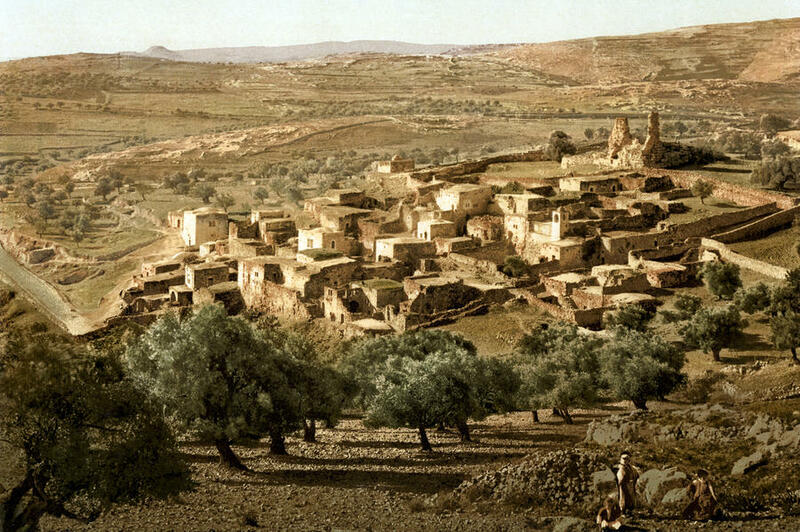 Even the most highly esteemed king in all of Israel’s history fell prey to the allure of sin. It was a slow progression. And the sin with Bathsheba was not the last or only sin he would commit. We have the joy of knowing there is hope for us because Jesus, the God-man, secured our redemption. He is Risen! These are David’s wives – Hearts Devoted to a king.